Star Wars ZipBin Stormtrooper Carry Case: Join the ranks of the Empire's most elite soldiers and strike fear in the heart of the Rebel Alliance by taking home the Star Wars ZipBin Stormtrooper Carry Case. With room to fit all of your favorite Star Wars figures, the case is a simple storage solution that wipes clean with a damp cloth for any unexpected spill. 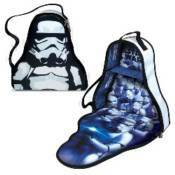 The Star Wars ZipBin Stormtrooper Carry Case is recommended for ages 3 and up. The inside of this case measures about 12-inches tall and divided into 2 horizontal parts. The top space measures 5-inches tall while the bottom measures 7-inches tall. Perfect for holding standard 3 3/4-inch tall action figures!